Homespun Stitchworks..... For the love of vintage: Book review .. The lampshade ladies guide. 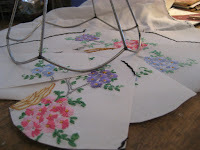 The Lampshade Lady is passionate about making lampshades and uses everything from old-school children's cloth books and vintage fabrics to antique laminated postcards in her unique creations. These 50 projects range from a simple child's night-light to elaborate, embellished shades that would make any interior designer swoon. Different as they are, each has the ability to transform a room and give it a personal stamp. Readers will learn about the simple materials and tools for making shades and get tips for refurbishing old lamps, building new ones from unexpected objects and crafting unique finials........ This is what Amazon has to say about this superb book. It was this description that I fell in love with it and popped it on to my Birthday and Christmas wish list. I was lucky enough to receive it in my pile of books that I get from my husband yearly. I have had a chance now to look through and read some instructions which are very clear and concise. Some of the lamps in this book are just pure vintage wonder. It shows you how to cover different shades and also gives you ideas on what fabrics you might want to use and to what effect. ones, it seems for everyone. Also in the index there are sections for intermediate and advanced so that you can read through the instructions and decide from there which one you might like to tackle. The introduction in the book is a wonderful read on its own and explains how this lady began her journey in to crafts and textiles. She has a wonderful shop in Vermont in America and is often known as the lampshade lady! There is some great advice and help with a list of basic lampshade making supplies and adapters for achieving the perfect fit, along with a word about fabrics and trims too. In addition to that there a several pages dedicated to lampshade making with basic techniques and this to read before you have the hard job of deciding which beautiful shade you wish to make and includes choosing the right size for the right base as well. This book is not only very informative and precise but stunning with great photography, you will find it irresistible and hard to put down. someone who loves making. Even a beginner could tackle a shade from this book. I give it ten out of ten. The book is by Judy Lake and can be purchased on Amazon or ordered from you local book shop. Well I am off to my stitching today and I will report more on that when I have a little something to show you. Later in the week ( Friday I am off to London to the Victoria and Albert museum so I will be blogging about the exhibition I am off to see next week. Have a great day all and keep warm and dry and as always Happy Stitching!